Gabie drives a Mini Cooper. She also works part-time as a delivery girl at Pete's Pizza. One night, Kayla—another delivery girl—goes missing. To her horror, Gabie learns that the supposed kidnapper had asked if the girl in the Mini Cooper was working. Gabie can't move beyond the fact that Kayla's fate was really meant for her. She becomes obsessed with finding Kayla and teams up with Drew, who also works at Pete's. Together they set out to prove that Kayla isn't dead—and hopefully to find her before she is—in The Night She Disappeared by April Henry. 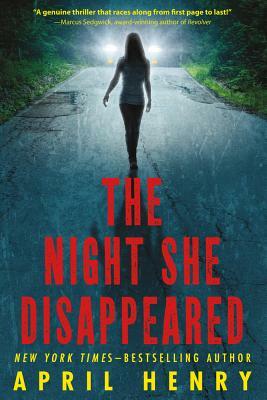 April Henry is the New York Times bestselling author of many acclaimed mysteries for adults and young adults, including the YA novels Girl, Stolen and The Night She Disappeared and the thriller Face of Betrayal, co-authored with Lis Wiehl. She lives in Oregon.